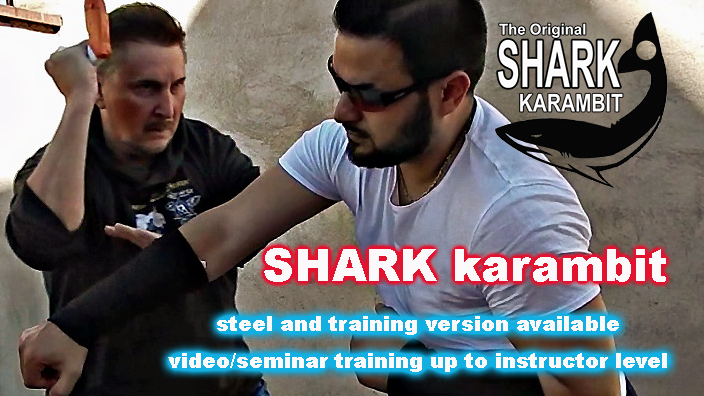 ..:: SHARK KARAMBIT - the perfect Tool for tactical use, Survival and self defense, close combat - SHARK knife Malak Kali concept ::.. The steel edge for your hand! 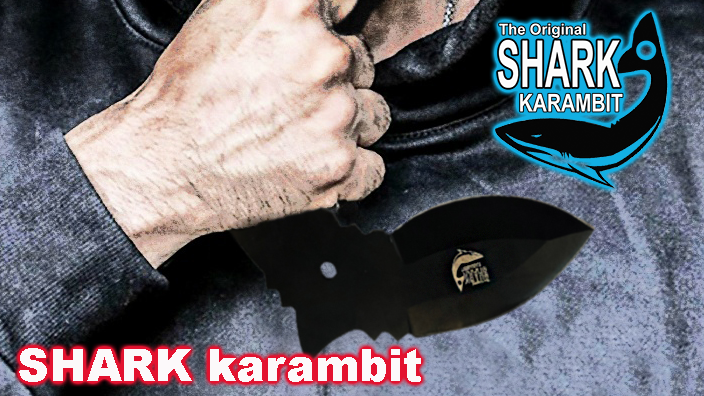 SHARK Karambit- developed by security experts in the USA, France and Israel - produced with pride in Europe. Seriously UPGRADE your SELF-DEFENSE! We believe the SHARK Karambit is the perfect knife for your self-defense: it is lightning fast, highly effective and can be combined with any fighting system. The Shark allows you to block, stab, slash, cut, saw, hold and pin down, grab, hack, strike, and you can even throw it with great accuracy. Use it tactically, in survival situations, and for personal defense. Since the SHARK has been designed for DEFENSIVE purposes, and since it can do much more that just stab or cut, it can be used for legal self-defense. Make the SHARK karambit your no.1 defense tool and/or backup weapon. We offer you top-of-the-shelf training - from beginner up to instructor level. If you want high-grade training in the use of this awesome defensive tool, or if you'd like to organize seminars with us at your town or school, contact us any time! Do you run a self-defense school or are you selling self-defense equipment? The SHARK karambit will be a great addition to what you are offering your clients now. We welcome inquiries by partners, schools, retailers, online shops etc. Do contact us any time. says THANK YOU for your interest! We are convinced, if you are interested in the best possible self-defense, that the SHARK Karambit will LITERALLY GIVE YOU AN EDGE... - in fact: an EDGE OF STEEL for your hand. 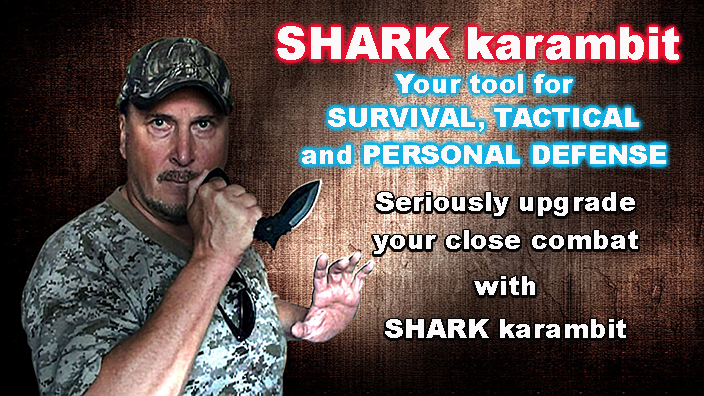 The SHARK is the perfect device for your tactical close combat, as well as for personal defense. Anyone can use it as it is totally intuitive. Men and women alike will be able to defend themselves safe, efficient, and legally sound - against armed and unarmed attackers. The SHARK is inconspicuous, lightweight, can be carried all day long. Is training available for the SHARK? Yes, we have training available in video format for your self-training at home or anywhere else - from beginner level to advanced. An introductory video comes with each SHARK karambit. In addition to the videos, we offer seminars in various locations around the world, from beginner level up to instructor training. If you are interested in these seminar or in organizing seminars with us, please contact us for more details. The original SHARK karambit is being produced in Europe by COBRA SYSTEMS LLC. The design of this knife has been registered with the German patent authority and is thus protected. It is made of 1075 steel and comes with a Kydex sheath, intended to wear as a neck knife but can be carried in many positions on the body. Who can use the SHARK? The SHARK has been developed by expert under cover agents and professional close protection instructors. Thus, it has been created for the tactical use. It is a great solo or backup weapon for all security personnel. However, the SHARK karambit can equally well be used for personal self-defense. Provided you use the SHARK in the intended way, you can LEGALLY use it for self-defense. Do you accept new partners and retailers? Yes, we happily concider new partners, retailers, online shops and affiliates! The Shark will be a fantsatic addition to your programme. If you run a self-defense school or group, or if you are a retailer for self-defense and/or survival related products or simply which to resell the SHARK in order to earn great commissions, you are very welcome to inquire with us any time. If you have any queries about SHARK karambit, please contact us any time! Dealers/Affiliates and Partner inquiries are welcome.